He is doing great he can go up and down the stairs already and what a character. 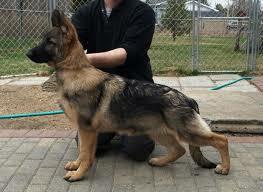 is going to be a calm dog not much phases him it is wonderful. Thank you so much. she is with kids and people very laid back and well behaved. House breaking has been a breeze. All in all I can’t thank you enough for giving us the pleasure of having her join our family. She is the break I have needed for a long time thank you again. J.J. and the kids. experience of a german shepherd and we feel we made a very good choice in Dasha. keep that name because they really liked his dad’s name. Thanks for everything Robroy. She is the most sweetest little girl and we are so pleased you considered our home for her to live. updated pictures. Thank you for blessing our home with a precious gift Jackie & Dean. yesterday and she was so well behaved, I am very proud. don’t think a day goes by when one of us doesn’t comment on how lucky we are to have her. I hope you all are well. I wanted to drop you a quick note about our amazing puppy. Christmas morning went great! The kids were so surprised and excited and so was Cathy. when old Prince is gone…we have to get another one from you so you better stay breeding! demeanor and his character- that we are very proud of our Magnum and you as a breeder.